A key issue raised by labor unions in their weeklong strike against Verizon is the offshoring of work. 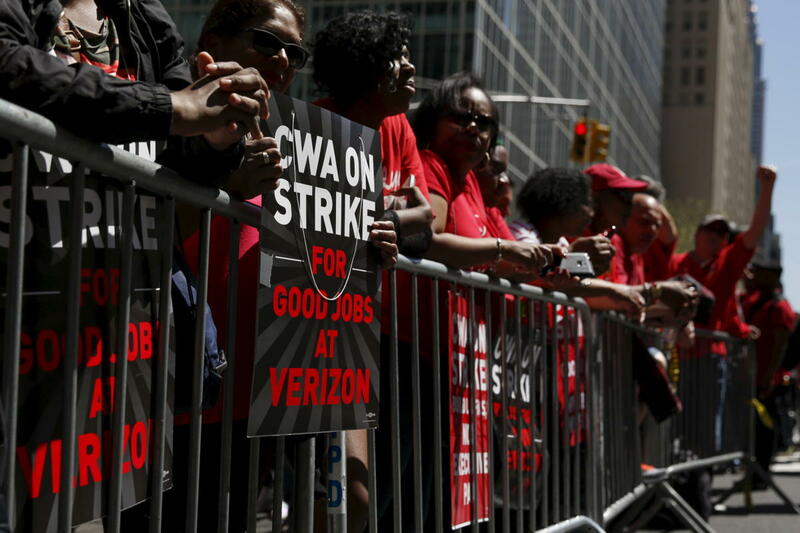 The unions say Verizon has plans to send more jobs overseas. Verizon isn't saying what it is doing in this respect, but there is a paper trail of documents filed by its employees that point to offshoring. The union contends that Verizon wants, in a labor contract, to shift more jobs to contractors. Nearly 40,000 Verizon workers are on strike. "They want the ability to contract work -- as much as 50% -- the great majority of that is offshore," said Marilyn Irwin, president of the Washington area Communications Workers of America Local 2108. CWA is one of the unions involved in the strike. This complaint is getting attention in the presidential race, including from U.S. Sen. Bernie Sanders, who is seeking the Democratic nomination. "They want to outsource decent paying jobs," Sanders said at the Verizon picket line. Earlier this month, Sanders said Verizon wants to move call center jobs out of the country to places "where people will be paid pennies an hour." Sander's criticisms of Verizon prompted a response by Verizon CEO Lowell McAdam in a blog post. "Contrary to Sen. Sanders's contention," wrote McAdam, the proposal that Verizon is making to the union does "not call for mass layoffs or shipping jobs overseas. Rather, we've asked for more flexibility in routing calls and consolidating some of our call centers, some of which employ a handful of people." Despite repeated attempts, Verizon did not respond to requests for comment. Over the past several years, Verizon workers have been filing applications with the U.S. Labor Department for Trade Adjustment Assistance (TAA) benefits. Employees who believe they have lost their jobs as a result of offshore outsourcing can file for benefits that include extended unemployment and educational help. Verizon workers in multiple states, including Texas, Oklahoma, Florida, New York and North Carolina, have filed claims. These can be filed by state labor officials or affected employees. A minimum of three affected workers must file the application, which, if approved, can make other affected employees at a worksite eligible for benefits as well. For instance, in Lake Mary, Florida, employees wrote on their TAA application: "Verizon has been in the process of moving all production for all products off shore for the last few years. We were notified in April  that all the remaining VOIP Order Management was being moved to Manila. Two VOIP order managers had been sent to Manila to train the new group. … My group also had to train the offshore group to take over our job function. HR told me this was a massive layoff!" In Texas, requests for benefits from employees have stated that "work was outsourced" to Manila. The employees said 20 workers lost their jobs. In North Carolina, workers also cited Manila, and said 11 jobs were lost in that state. A New York, a TAA petition filed by IT workers said: "Due to a reduction in force, our jobs were eliminated. However, the function continues offshore."